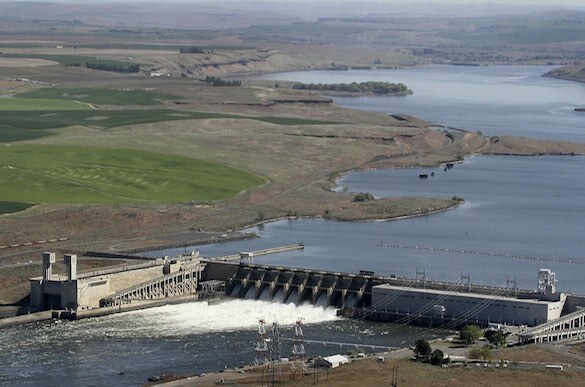 The House this week could take up a controversial bill that would overturn court decisions and effectively mandate more limited salmon protections throughout the complex Federal Columbia River Power System. The bill introduced last year, H.R. 3144, is authored by Rep. Cathy McMorris Rodgers (R-Wash.) and backed by the Washington Farm Bureau, as well as myriad utility districts. The measure will reach the floor as McMorris Rodgers faces an uncertain fight for re-election later this year. "Hydropower helped build the Northwest, and still today it offers us clean, renewable, reliable, and affordable energy to help power our homes, businesses, and communities," she said, adding that "my goal is to ensure that dams and fish can co-exist" (Greenwire, April 11). The proposal is opposed by the likes of the Pacific Coast Federation of Fishermen's Associations, the National Wildlife Federation, and the Democratic governors of both Oregon and Washington. "If enacted, H.R. 3144 will cause unacceptable harm to the tribes, environment, legal process, and Pacific Northwest businesses that support thousands of jobs," stated Rep. Raúl Grijalva (D-Ariz.) and five other Natural Resources Committee Democrats. In other words, the six-page bill reopens the kind of Endangered Species Act debates that have filled entire libraries since the law was signed in 1973. In the case of the Federal Columbia River Power System, the ESA requires the Army Corps of Engineers, Bureau of Reclamation and Bonneville Power Administration to consult with NOAA Fisheries and the Fish and Wildlife Service on how project operations may affect protected fish. Consultations lead to biological opinions, which are inevitably followed by lawsuits. Generally speaking, the biological opinions have not fared well in court. "Throughout the history of this litigation, the Court has expressed significant concern regarding the harm caused to ESA-listed species of salmonids by the operation of the dams on the lower Columbia and Snake rivers," Oregon-based U.S. District Judge Michael Simon noted last year. An Obama administration appointee, Simon in March 2017 ordered federal officials to spill more water for the sake of the salmon and steelhead. "Environmental organizations and others believe that spills aid in fish passage, while others ... counter that spills, costing tens of millions of dollars, decrease hydropower production and provide little benefit," the bill's committee report states. McMorris Rodgers' bill jumps into this never-ending fray, requiring the system to be operated until 2022, according to a 2014 supplemental biological opinion issued by NOAA Fisheries. The bill also prohibits any structural modification or removal of the hydropower dams unless authorized by Congress. The Congressional Budget Office estimates that McMorris Rodgers' bill, by reducing the amount of water in the spillways, would result in an increase in electricity generated and sold, and a reduction in BPA's costs. "Savings would be passed on to customers in the form of lower electricity prices," the CBO states. The House Natural Resources Committee approved the legislation April 11 on a 23-17 vote. The measure next goes to the House Rules Committee, which will clear the way for floor action. Schedule: The hearing is Tuesday, April 23, at 5 p.m. in H-313 Capitol.